Miller, 26, had long rapped about his battles with addiction, but was on a career upswing with a new album. 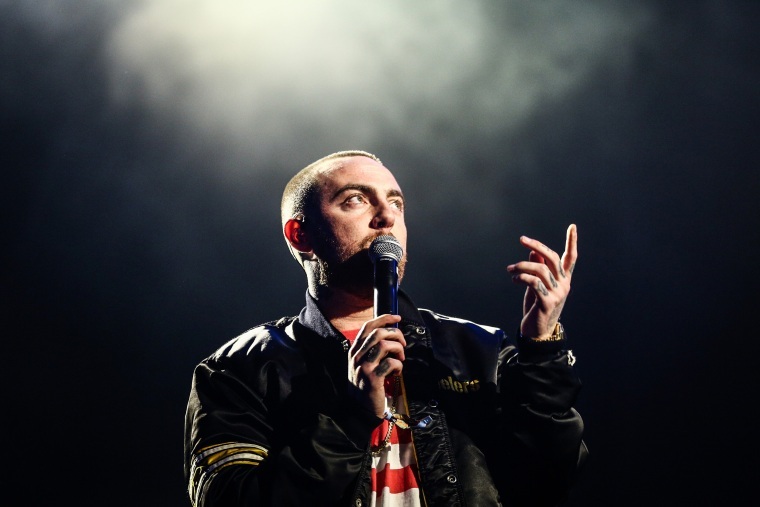 Rapper Mac Miller was found dead at his home in Los Angeles of a possible drug overdose on Friday, two law enforcement sources told NBC News. "He was a bright light in this world for his family, friends, and fans," his family said in a statement. Miller, 26, had publicly spoken about his battles with addiction over the years, in particular to a concoction of cough syrup with codeine and Sprite, known as "lean," but he was in the midst of a career resurgence with the recent release of his fifth album, "Swimming." A tour in support of the album was scheduled to kick off on Oct. 27 in San Francisco. Before the release of that album, Miller had been in the headlines of gossip glossies more than the music trades in recent months. In May, he endured a high-profile breakup with former girlfriend Ariana Grande and was arrested at home after driving into a utility pole, leaving his vehicle at the scene and then testing over the alcohol limit. The Los Angeles County District Attorney's office charged him last month with DUI and hit and run in the incident. Born in Pittsburgh as Malcolm McCormick, the son of an architect and a photographer reportedly taught himself how to play piano, bass, guitar and drums as a young child, switching to rap in high school. Miller had skyrocketed to fame eight years ago with the release of his mixtape, "K.I.D.S. (Kickin’ Incredibly Dope S---)," which earned him a contract with Rostrum Records. A year later, his first album, "Blue Slide Park," debuted at number one on the Billboard 200 chart. Miller quickly gained a reputation for witty wordplay, finding success with the Billboard-charting tune "Donald Trump" in 2011, and inciting a social media vendetta from the future president of the United States in the process. His charming delivery helped land him a reality series, "Mac Miller and the Most Dope Family," in 2013, which ran for two seasons on MTV2. Rather than continuing the party rap formula that launched him to superstardom, however, Miller opted to experiment with more eclectic arrangements and more mature themes on his followups. On his 2014 mixtape, "Faces," for example, the rapper mined his own drug addiction struggles for lyrics. His fame came at a cost. In an interview with Vulture that was just published a day before his death, Miller confessed to anxiety over the expectations heaped on him by the industry and his fans. “When I first started, I thought I was going to be the biggest thing in the world,” Miller told the entertainment site. “There was this time when I was the most Googled thing on the internet. It was like ‘diet, carrots, and Mac Miller.’"
"A lot of times in my life I’ve put this pressure to hold myself to the standard of whatever I thought I was supposed to be, or how I was supposed to be perceived. And that creates pressure," he added. Sources said the Los Angeles County coroner is likely to remain the lead agency in the death investigation. Final toxicology results are expected to take months. "I'd rather be the corny white rapper than the drugged-out mess who can't even get out of his house," Miller said in a 2016 documentary video for Fader. "Overdosing is just not cool. You don't go down history because you overdose. Tributes from his peers flooded social media Friday. "Mac was a hugely gifted and inspiring artist, with a pioneering spirit and sense of humor that touched everyone he met," Warner Bros. Records co-chairman and COO Tom Corson tweeted. "Mac's death is a devastating loss and cuts short a life and a talent of huge potential, where the possibilities seemed limitless." Chance the Rapper tweeted: "I dont know what to say Mac Miller took me on my second tour ever. But beyond helping me launch my career he was one of the sweetest guys I ever knew. Great man. I loved him for real. Im completely broken. God bless him."